For those who don’t know: Steins;Gate was one of, if not THE, best shows of 2011. If you haven’t seen it, don’t start here; start by watching the show for yourself. If you are wondering what it is about, take a look at my first impression post, as what follows contains spoilers. The one thing I would add is that this story delivers right up through the closing scene. For those of you still reading, you know pretty much what to expect. One final adventure with the Future Gadget Lab (that is, until the movie comes out). As Steins;Gate was airing I kept thinking, this is great, but they still have time for everything to fall apart. Then, when they made it back to the βeta world-line, I felt so satisfied that I knew this was a successful story. I enjoyed the characters. It had some special moments along the way. And now it had a satisfying ending, with some sort of post-script coming up. Last week’s episode, then, was almost a shock. How do you improve upon satisfying? By having your cake and eating it too. Here (via the wonder of Time Travel) we had the very rare chance to do just that. In Hououin Kyouma’s words, we would “change the result, without changing the established past”. Get ready to be impressed, Part-Time Warrior. I have a tendency to put a lot of emphasis on the visual experience, so I was very surprised that Steins;Gate, which has decent (and arguably unique), but not overly impressive visual style really kept my attention. It did this by great writing (an excellent plot, and wonderful characters), and very effective voice acting. As the episode began, I was happy just being with the various characters. Then, as the mission was carried out, I was nervous — caught up in the question of whether it would really succeed. Finally, in the closing minutes, tears of joy flowed relentlessly. This episode had the perfect blend of comedy, tension, heroism, and harmonious nostalgia to properly end the series. The tension while Okabe struggled to create a new future that, while consistent with the past, not only freed humanity’s future, but saved Kurisu was intense, and the resulting relief contributed to my happiness as Okabe methodically bonded with the various Future Gadget lab members. One of my favorite moments was Kurisu anachronistically complaining that she had told Okabe she wasn’t his assistant, even though he had not yet called her such in this world-line. By the way, Funimation announced they acquired the rights to Steins;Gate, but I’m not sure they possess the rights to distribute on media, since their announcement specifies “home entertainment, broadcast, digital, and merchandise rights”. This was a good, satisfying way to end a good show. 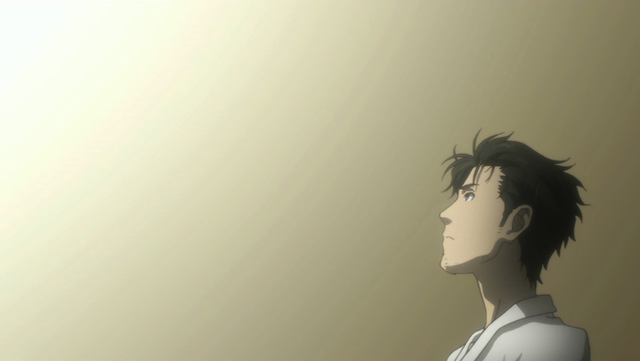 Okarin’s methods to save Christina’s life were really ballsy, and I’m just glad that the two of them were able to get a happy ending after everything they’ve gone through. The show really made its buildup work and ended things conclusively, and I always love seeing a show pull that off. Yes. I completely agree. There were a couple of weak episodes, but overall this was the most solid and entertaining show I have seen in a while. You just don’t get shows that fit together this nicely very often. I saw another review that said people should just skip the first 12 episodes. ??? No! I think this show was great from start to finish. And I expect Usagi Drop to steal the fifth or fourth place. 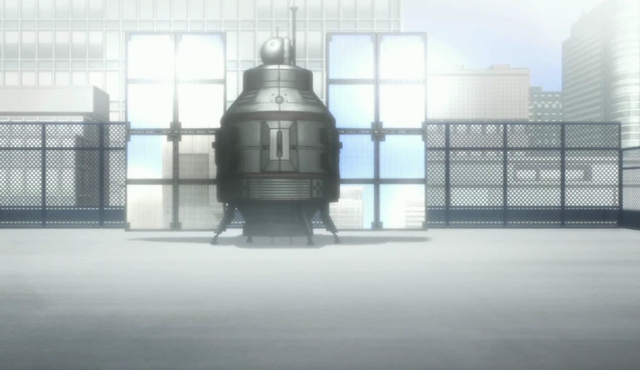 But back to Steins;Gate: I’m a complete sucker for well done time travel stories, with plenty of turns, dark twists and warped paradoxes. And I never get them. S;G however has changed that by providing me with exactly what I wanted and perhaps even more. Together with this fact that I love time travel I knew this was going to be directed by a very competent individual, Hiroshi Hamasaki (Shigurui, Texhnolyze) so my expectations were extremely high and weren’t betrayed in any way. My only bad reference was that the original game was from the same company as Chaos;Head, whose anime was totally disastrous. Can’t believe the same company did them because the quality gap is immense. The plot was very solid throughout, and very well blended with effective comedy and character development (both as individuals and as part of a group). However says the first 12 episodes should be skipped has no idea what he’s saying since, while the true awesomeness of this show kicks in during the second half, there’s a lot of gold to be found in the first as well. And hell, this is not an episodic show, you have to watch the whole thing to understand everything… so to those people I shall dedicate here a big”shut up”. 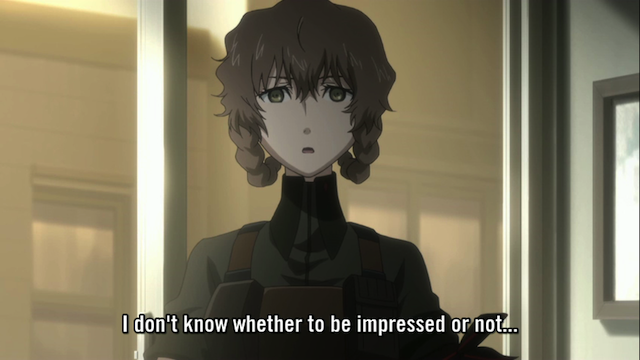 The characters were all very quirky and nice, my absolute favorites being Hyouin Kyouma (heh), Suzuha, Kurisu, Daru and Mayuri, in that order. Even the least interesting ones like Ruka or Moeka had something good to say about themselves during these 24 episodes. As for the production values, both animation and sound were top-notch, with gorgeous backgrounds, a beautiful dimly-lit style, befitting soundtrack and amazing/hilarious voice acting. Some people are saying the ending was meh but I found it really good. Even though when the series was starting (and halfway in) I was expecting it to move to a bigger scope soon (more involvement with SERN, etc), the show still did a great job working with just a few nicely done characters to create an epic story nonetheless, and it also managed to surprise me in several occasions with its marvelous twists. Waiting for this anime to end before watching it was my best decision in a very long time. The weekly wait would have been nearly insufferable, and instead of that I got yesterday a hell of an awesome marathon I hadn’t been able to enjoy since the likes of Kaiji I and Shiki. Great comment. I agree with most of what you had to say (the real exception being, I never took a liking to Gintama). I can’t believe people who didn’t like the end, I thought it was AWESOME. I was hooked on this show from the very first episode, and it kept on delivering. I wouldn’t hesitate to recommend it. …but that’s a good thing! An ending like this needs to be sudden and delivered with a bang, with action the entire way. 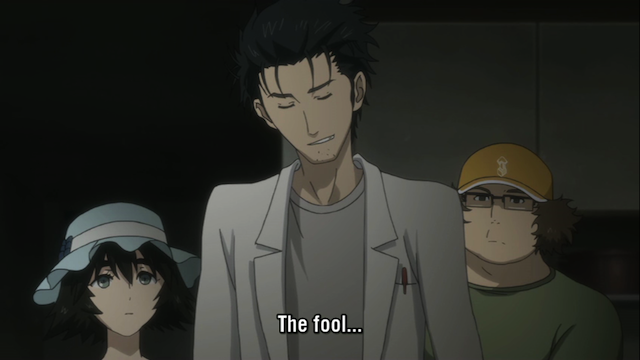 If anything, I think Steins;Gate should’ve been shortened to 20 or 22 episodes – although it was /nice/ that there were so many Mayuri episodes, it wasn’t /necessary/, and they definitely detracted from a more seamless experienced that would have been possible if Steins;Gate was condensed. And yep, being late for a month on anime and having to write a post in a day, guess what I did yesterday? Watch the last five episodes in one sitting, of course. Well, sometimes it is best to end it once the story is over. Some shows want to tie up every last thing, and that is a mistake. I recently watched some old TV mysteries (especially Colombo), and I was impressed that they ended the show RIGHT after the mystery is truly solved (in Colombo’s case that is when he has proven who the killer is). The outcome is in doubt up until the last minute, then the end hits, then the show is over. This is very effective. I’ll probably marathon Steins;Gate if it gets released in the States. I really enjoyed it, and would be happy to watch it again some day.